Installation of fire doors is as life critical as the product specification itself and should only be carried out by someone who is competent, has been specifically trained to install fire doors and understands their responsibilities in getting it right (and ideally as part of a third party certificated process). Fire doors that are incorrectly installed and fitted with incompatible components invalidate certification and will not provide adequate protection for occupants or the building.All fire doors supplied through the Fire Door Alliance are provided with installation instructions that are specific to the product. Installation methods and materials can change depending on a number of factors, including product type and installation environment and so it is vital that these are referred to and adhered to. Essential Ironmongery such as locks, latches, closers and hinges MUST be CE marked, firmly fixed with no missing screws and compatible with the door leaf’s certification. You can search for a Certificated Fire Door Installer on this independent Registered Installer website. How do I fit glazed or non-glazed apertures in a fire door? In some situations ‘glazed vision panels’ or ‘glazed apertures’ are required to be added to the door to allow for additional light or vision of the other side of the door. Non-glazed apertures may be required in the case of louvre panels or air transfer grilles. It is vital to remember that the addition of ANY apertures will seriously affect the performance of the door unless it is undertaken ONLY by companies that are licensed and approved to carry out this type of work to agreed procedures. Cutting and glazing apertures must NEVER be undertaken on site and will negate the door’s test certificate. You can use our BWF Fire Door Alliance Directory to find a company who is licensed to modify doors or provide certificated doors with apertures. 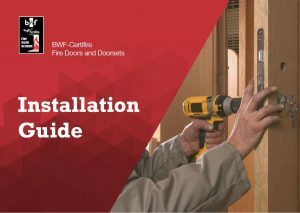 The British Woodworking Federation (BWF) has developed a new qualification specifically to target the installation of fire doors in the UK. – the course focusses on individual competency and enables endorsement as a Fire Door and Doorset Installer on the CSCS Card. The qualification will be available as an optional unit for apprentices initially via the NPTC Group of Colleges (although BWF is actively working to grow the network of suppliers) as well as a two to three-day course and assessment option aimed at experienced tradespeople. It will enable individuals to work towards and achieve unit 358 ‘Installing fire resisting timber door assemblies and doorsets in the workplace’. Once achieved, the unit can be displayed on the reverse of the Construction Skills Certification Scheme (CSCS) card, which is used to demonstrate that individuals working on construction sites have the required training and qualifications for the type of work they carry out. To access more information on the course via NPTC, click here. Why BWF has worked to develop a new Fire Door Installation training qualification. Why a new Fire Door Installation Qualification will help to improve the market.